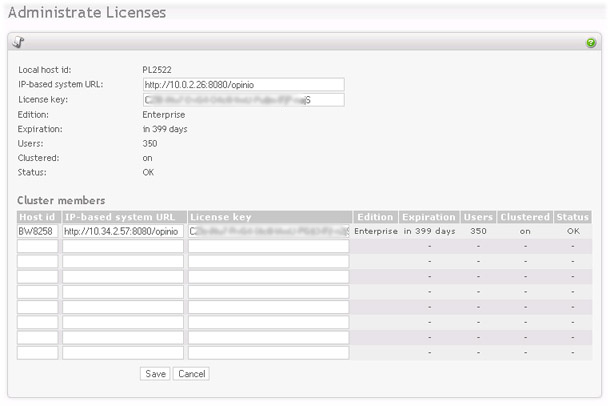 The license page lets you set up all the license keys for your Opinio installations, whether it is a single installation, or if there are multiple cluster members. Each Opinio installation will have a unique HostID. This is used to generate the license key. The host ID of the current Opinio installation is shown at the upper part of the screen. When entering this screen the first time, the HostID for the current Opinio installation will be shown at the top of the form. Enter the IP-based URL and a valid license key in the other columns, and click 'save'. Local Host id: The unique ID that identifies each Opinio installation. This is used to generate the license key after purchase. Ip-based system URL: This is the URLs Opinio uses for communication (mostly for transferring files) between cluster members. It does not apply if you are running Opinio in single-server mode. It is very important that all URLs are set correctly when running in clustered mode. License Key: This is the license key that enables various features in Opinio. It is the license key that determines the edition you are running. Expiration: The number of days until a new license key must be obtained. Users: The number of Survey authors/admins allowed in the system. This number indicates named users. This means that the license determines the number of users you can register/create in the system. Once you reach this number, you will no longer be able to add more users, unless existing users are deleted. The number of survey respondents is unlimited, no matter what kind of license you have. Even without a license key your surveys will still run, and Opinio will still accept responses. Clustered: Shows if clustering is turned ON or OFF for this particular Opinio installation. This is determined by the license key. Status: Shows if the license key is OK or invalid. This allows for configuring the license key for all members in the cluster. The top part of the screen is the same as when in single-server mode. The license key at the top part of the form is for the server you are currently connected to. The lower table is for configuring other members in the cluster. Note that if you are connected to the cluster member through the load balancer, you could be connected to any of the members. To test if all cluster members have their IP-based system url set up correctly, click on Test IP-based system URL in the left menu box while in license setup for clustering. Once the test is complete, you will receive a status screen that will indicate if all cluster members are up and running and the IP addresses are configured correctly.